Need it fixed by a fully qualified, emergency plumber in Perth with super fast arrival time, no callout fees, and a fully stocked service van? Everyone knows that you should get insurance for those events in life that happen at the worst possible time, and when it comes to your home or business that is also true. From blocked toilets to leaking taps and hot water system break downs, Plumbdog Perth are on hand to respond to any plumbing emergency you may have. Then call Plumbdog Perth right away on 1300 884 146 to book one of our emergency plumbers. We are available right now across the Perth Metro area and promise to answer your call, day or night. We deliver a fast, no hassle service that has made us the plumbers of choice for all plumbing, gas, drainage and hot water emergencies. Whistle and we will come! 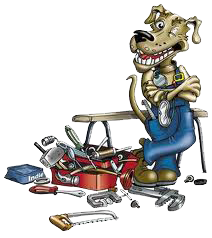 So, for the next time you have need of an emergency plumber in Perth (which we hope you actually don’t), remember to call the dog! Plumbdog Perth on 1300 884 146 or complete an enquiry form online. Our emergency plumbing service is available across Perth, from Joondalup to Rockingham, 365 days a year. Better yet, we guarantee to always arrive on time with our service vans fully stocked, so most problems get fixed in one visit, without the need to go to the suppliers. We will also only charge standard callout rates for jobs that are performed during standard hours – including emergency jobs. Hot water system on the blink? Whether it’s gas or electric, our plumbers have the vast knowledge and experience needed to get your hot taps running again with minimal fuss. Should you be in need of a new system and our suppliers are closed, don’t panic as we have temporary hot water systems on our service vehicles, so there’s no excuse to take a cold shower! We always promise to provide fast & efficient plumbing expertise 365 days a year. See how we work for a standard service call. Please keep in mind that you risk serious property damage if your plumbing emergency isn’t fixed as soon as possible. So if it needs attention, don’t delay, call Plumbdog right away!